Earlier this week I showed the process of working from my Parts & Starts bin to make a variety of cards from old junk mail, calendars, paint chips, and the like. I finished up a total of 6 cards from that session. 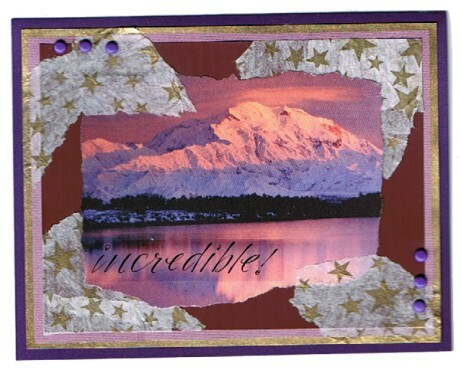 This card was the one I finished that first day, without camera glare this time! 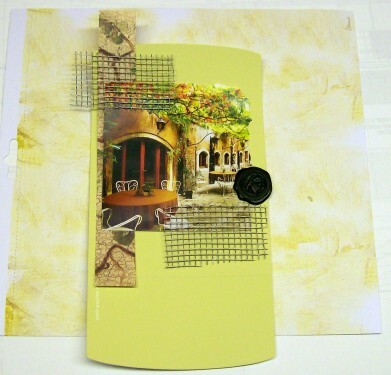 It uses a travel brochure picture, large paint chip, strip of scrapbook paper scrap, printed cardstock, wire mesh, brads, seal from a Kahlua bottle, and a clear sticker, all on green textured cardstock. Only the brads and clear sticker are not 'salvage' items. 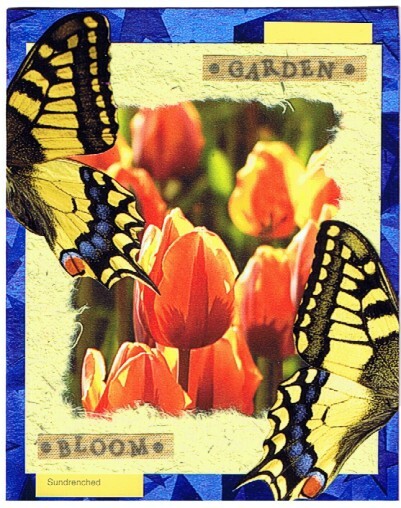 Card two uses a brochure illustration, a butterfly from a calendar cover, handmade paper, paint chip, blue tissue paper, and two cloth stickers. 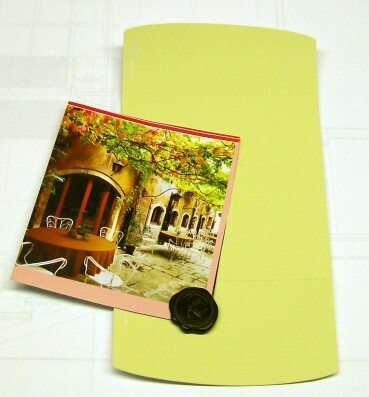 Although it does not show by looking at the front cover, the interior cardstock is bright orange. I left the paint color of the paint chip showing at the bottom as it was appropriate to the theme. On this card, only the stickers were not salvage. 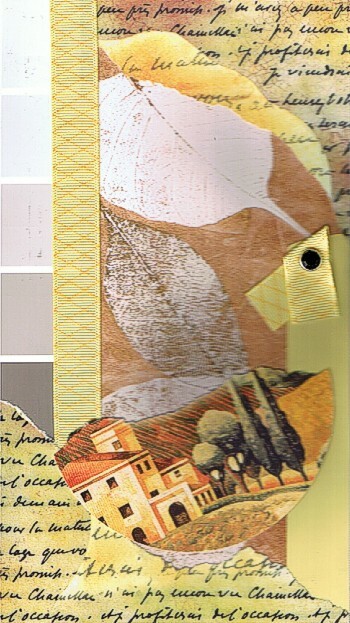 Next is a card made with a coaster from the Olive Garden restaurant, monoprint leaf paper, paint chips (2), grosgrain ribbon, printed scrapbook paper with text, and a rhinestone brad. The leaf paper was left over from some prints I made myself some years ago so the ribbon and the brad are the only non-salvage items. 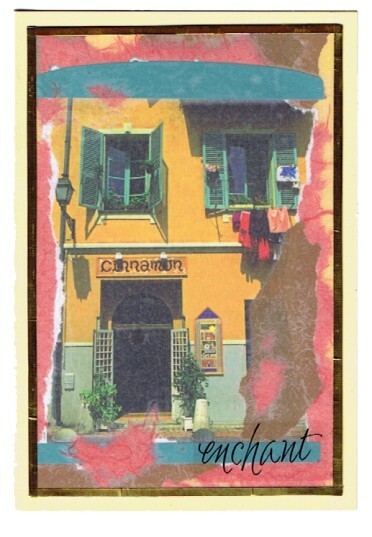 Next up is a card that uses a travel brochure illustration, paint chip, handmade paper, copper tissue, vellum, clear sticker, and metal tape. Originally the colors all matched the photo but the whole thing was too bright for my taste. So I ran vellum thru the Xyron and sealed the illustration behind it. Then the edges didn't stick together well enough so I added the metal tape to bind it. The vellum was scrap as was everything else other than the sticker and the metal tape. Here's a funky little card made with a catalog illustration, scrapbook papers (2), and stickers - two mock-3D and two fabric. 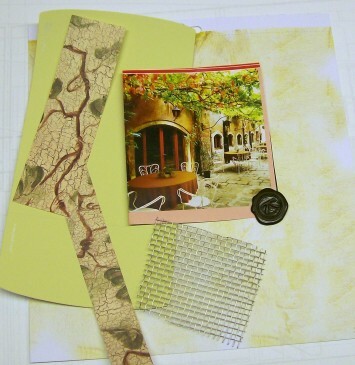 I cut the scrapbook papers with a variety of circles and finished off with round punches. Three of the punches go right through the front cover of the card. Only the stickers were not salvage items. This is my least favorite card. 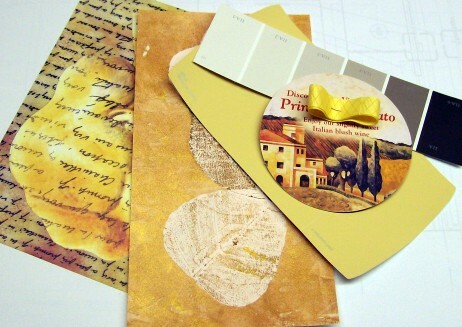 It uses a travel brochure illustration, paint chip, tissue paper, scrapbook paper, brads, clear sticker, and gold metallic marker. The brads and sticker were not salvage items. So, having finished up 6 cards from that session, all the bits and pieces are sorted back to their scrap bins and the worktable is ready for a new project. In the studio tour I mentioned having a "Parts & Starts" drawer. How many of you caught that??? How many of you understood that??? Well, here I am to explain it! Whenever I run across something interesting that I think I might want to use in art some fine day I toss it in a bin I call Parts & Starts. 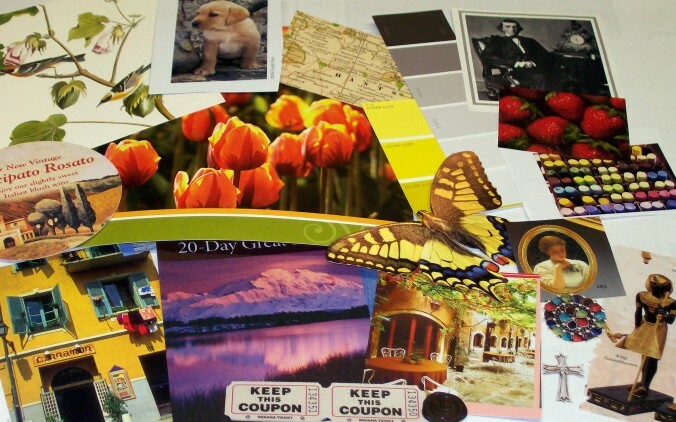 These might include calendar illustrations, magazine ads, catalog clippings, travel brochures, neat things torn off of commercial cards, a bit of metal - those kinds of things. When the drawer gets full or I feel like playing I take out the bin and spread stuff all over my work surface. Today I pulled out these things. Then I start rearranging things into groups that look good together. 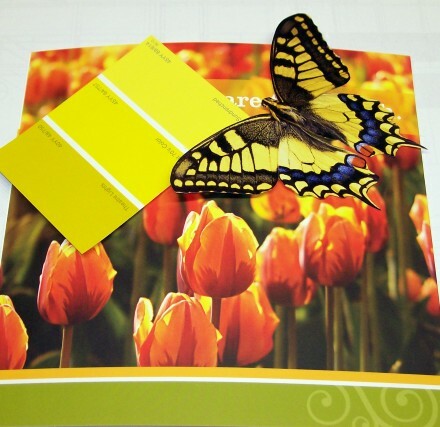 Here are 4 groups of things that I matched up: First is a paint strip, a brochure from the credit union, and a butterfly from a calendar cover. 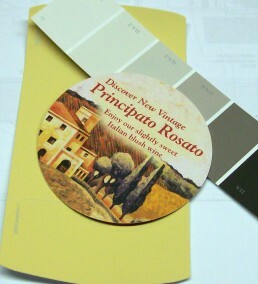 The second group is two different kinds of paint strips and a coaster from dinner at the Olive Garden. 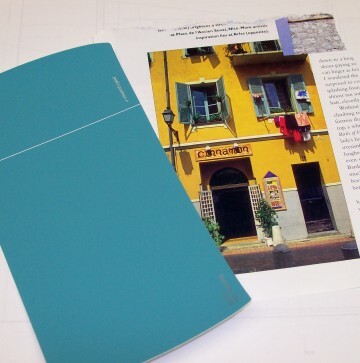 Group 3 is just a paint strip and an illustration from a travel magazine. Group 4 is an illustration from a cruise brochure, the seal off the neck of a Kahlua bottle, and another paint strip. (By the way these large single-color paint strips I get from my local hardware store are peel and stick - made so you can apply it right to the wall and see how you like the color without painting). To each of my groups of things I add coordinating bits from my supply drawers so I have a complete set of things to work from. For group 1 I added some handmade paper, tissue paper in both blue and yellow. 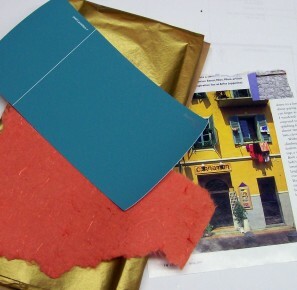 Group 2 picked up printed paper with writing, a leaf-printed handmade paper, and some grosgrain ribbon. Group 3 got some orange handmade paper and copper tissue. Group 4 was the set I ended up working with today. 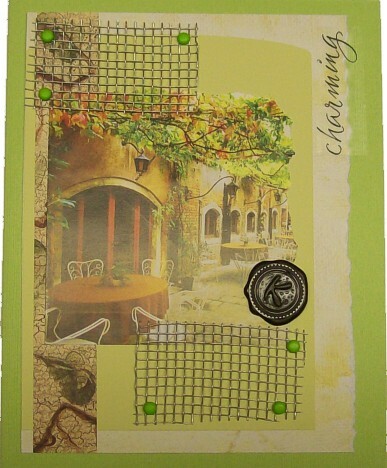 I added some printed scrapbook paper, printed cardstock with a plaster-finish look, and a piece of wire mesh. 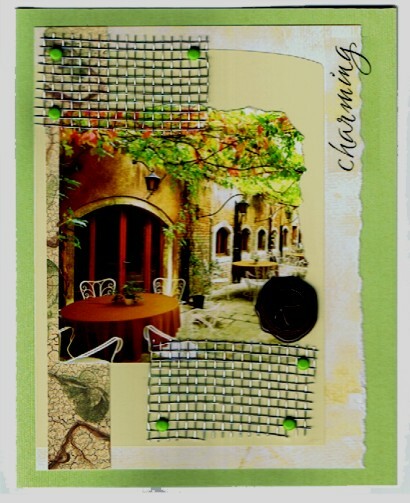 These elements were torn, trimmed and rearranged until I found a layout that I liked. Then I adhered them in place. I then tore the right side of the grouping, trimmed up the other two sides and used green brads to adhere the wire mesh on three sides. 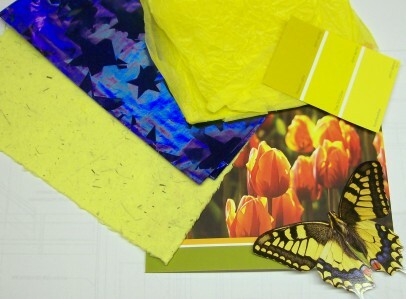 This reaffirms the green in the photo and 'frames' the collage. Finally, I it mounted on a folded green textured cardstock and added rub-on text as a title. 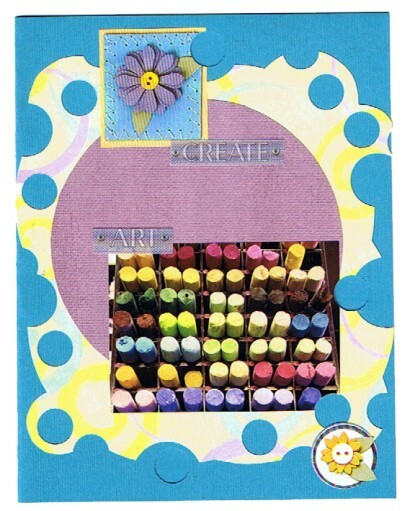 I will go back to my original groupings of supplies and finish them off in similar steps. When I am done, in a typical session, I might have anywhere from 6-12 cards to file for future use.